See scan - absolutely perfect condition. 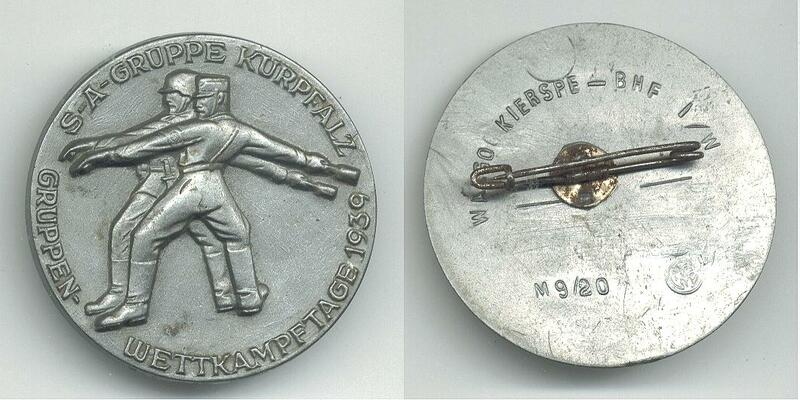 This is a nice and rare NAZI German 1939 SA-GRUPPE KURPFALZ GRUPPEN WELTKAPFTAGE circular Army badge. Diameter is 40 mm nd badge is made out of bakelite or other plastic material. The pin at the back has some rust on it, but badge / pin is in exceptional quality. Front shows two SA officers or soldiers throwing grenades and back is marked RZM M9/20 WALGO KIERSPE - BHF I/W. RZM also made accessories for the NAZI SS troops. Nice military / militaria collector piece and one of the nice German badges.